It’s back… and better than ever! The new Commodore 64 is a modern functional PC as close to the original in design and coloring as humanly possible. Futureproof in its design, it houses a modern mini-ITX PC motherboard that can be upgraded simply by switching motherboards. Commodore USA’s new C64x features Intel’s new 2.13Ghz 64-bit Dual Core D2700 Atom processor coupled with the graphics power of an nVidia GeForce GT 520 graphics chipset for improved 3D gaming ability. 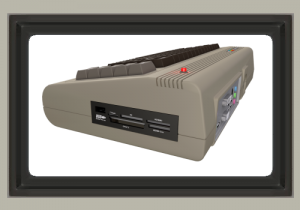 The new Commodore 64 also features an optional slot load R/W DVD or Blu-ray drive on the left side of the unit.The C64x comes with 4Gb of DDR3 memory as standard. A multi format card reader/writer and a USB slot are provided on the right side of the unit. There are additional USB slots on the rear of the unit for all your peripheral needs. The classic power light is now the power button. The new Commodore 64 can be connected to the latest televisions and monitors, and through the power of its nVidia hardware accellerated video decoding, can deliver 1080p HD quality video playback from either Blu-ray or an internet stream for an excellent home theater experience. Blutooth 3.0 technology and two external wireless n wifi antenae are included for exceptional connectivity to a home network or peripherals. 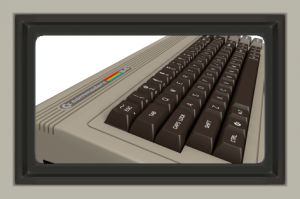 Commodore USA’s custom Linux distribution, called Commodore OS Vision, comes pre-installed on the C64x which will allow you to play all your favorite 8-bit era Commodore games with a single click. It even has the option to boot right into the original C64’s full screen READY prompt (left), where you can also launch classic games. 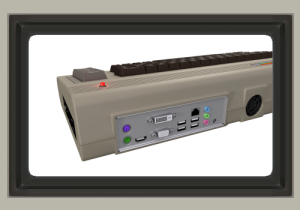 Commodore OS Vision also allows you to boot straight into the included XMBC Media Center allowing you to use the C64x as a home theater system.